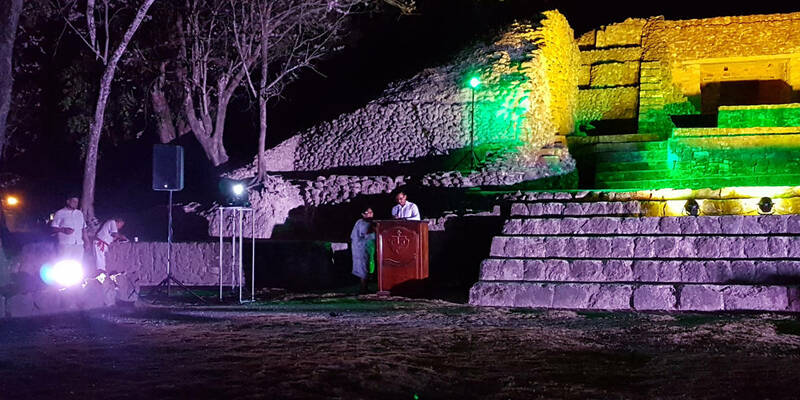 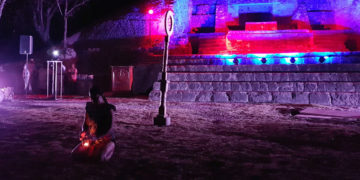 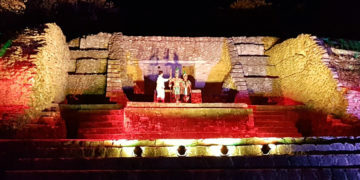 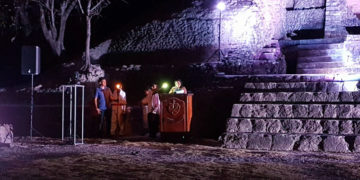 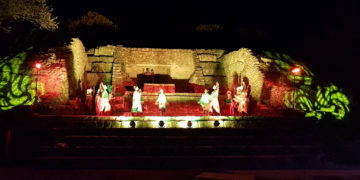 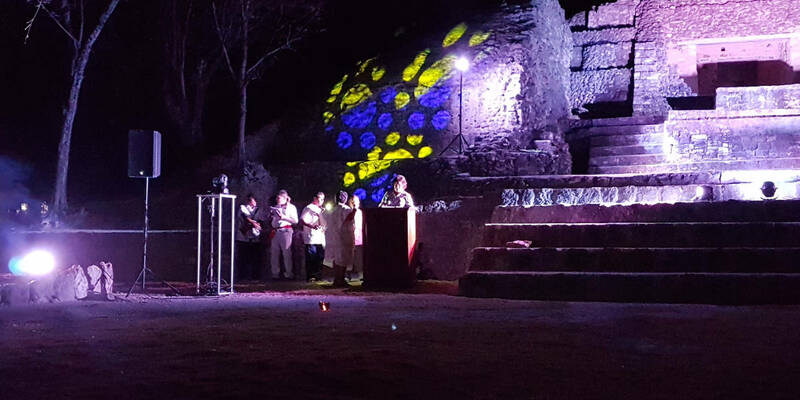 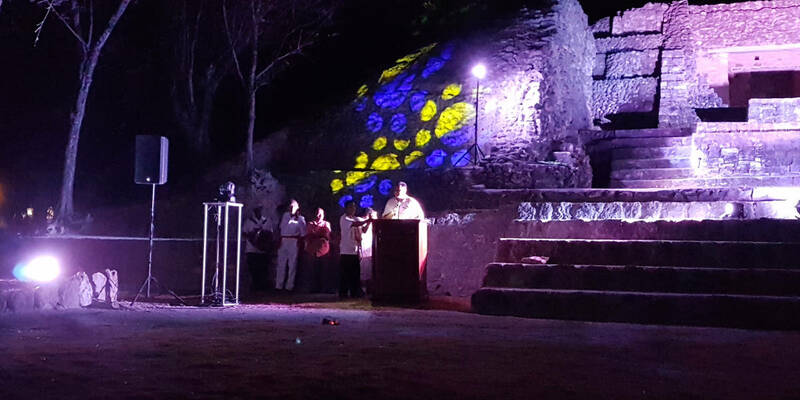 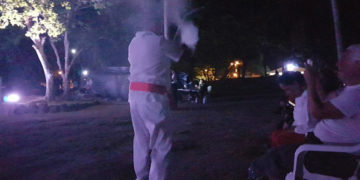 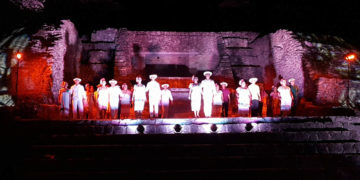 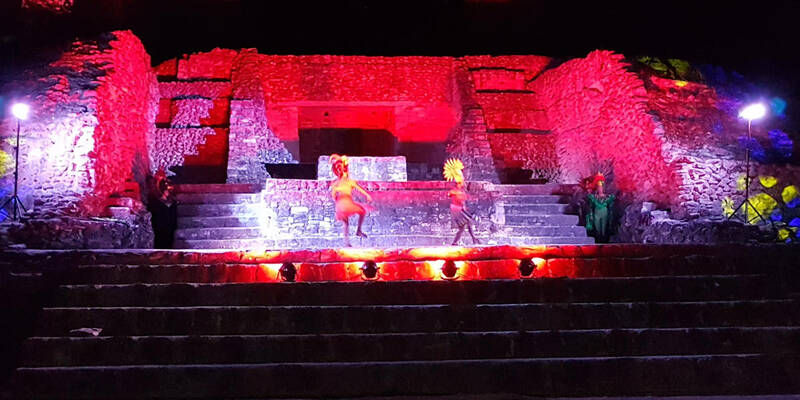 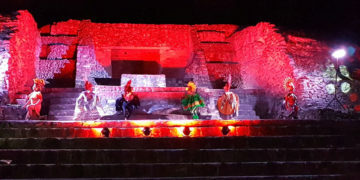 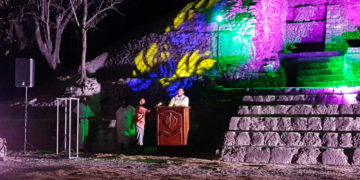 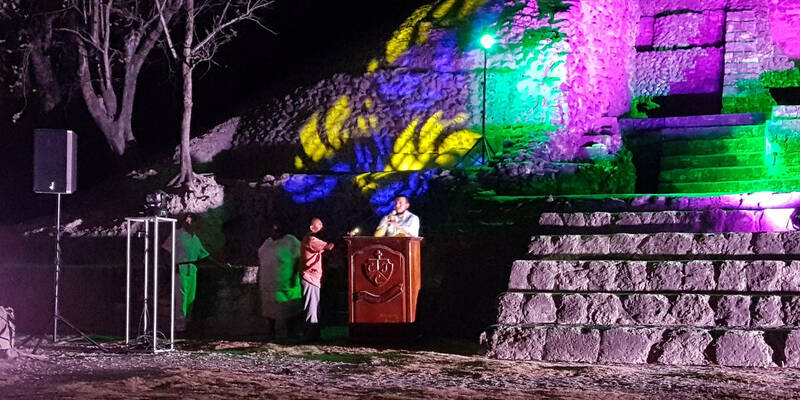 As part of the Corozal Coconut Festival 2019, there was a Maya Wedding Re-enactment, a Pok-ta-Pok demonstration, and other information presented on 29 March 2019 at Chactemal (the Santa Rita Archaeological Site). 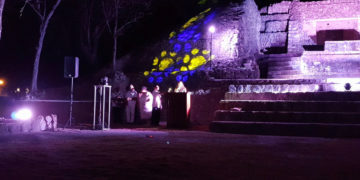 Mistress of Ceremonies Adela Pederson of the To’one Masehualoon (NGO) began with Maya ritual cleansing of the area by Maya Spiritual Leader Faustinio Yam. 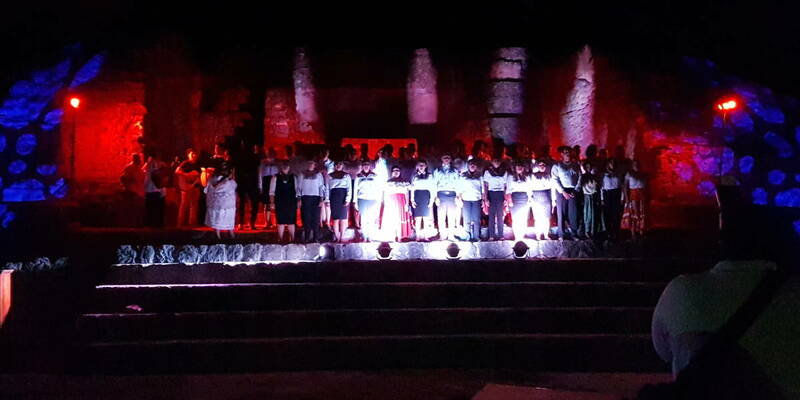 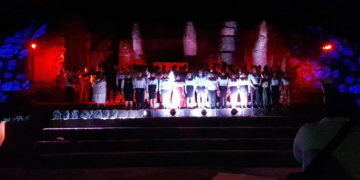 About 50 students from Centro Escolar México Junior College (CEMJC), supported by Ms. Pederson and To’one Masehualoon musicians, led the National Anthem of Belize, mostly in Yucatec Maya. 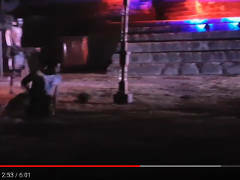 Click on the image to the left for a Youtube video. 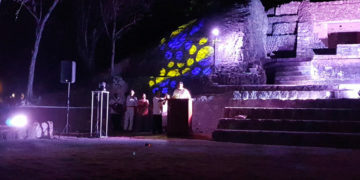 The invocation was done by Mr. Faustinio Yam. 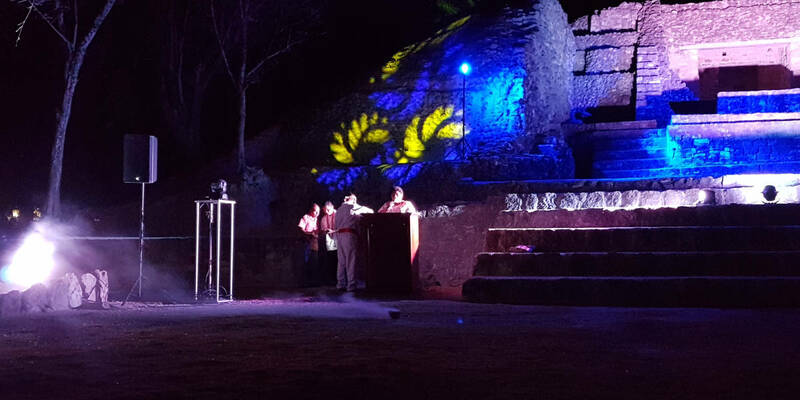 President of the Belize Tourism Industry Association, Melanie Paz, gave the Welcome Address. 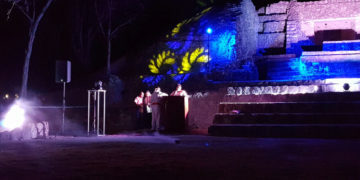 Honorable Hugo Patt, Minister of Natural Resources, gave the Minister’s Address. And History Teacher Nancy Leiva of CEMJC gave the history of Chactemal and the early 16th century Maya Wedding being re-enacted. 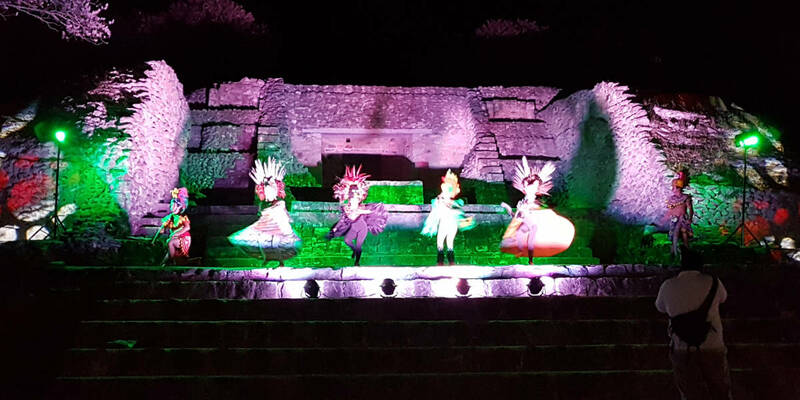 The talented Ballet Folklórico de Quintana Roo seem to get better every year. 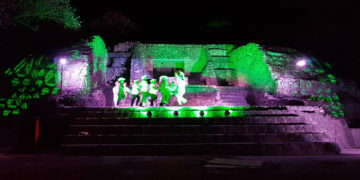 They did the Wedding Re-enactment, followed by traditional Maya/Mestizo dances. The photos that follow only give a hint of the experience. 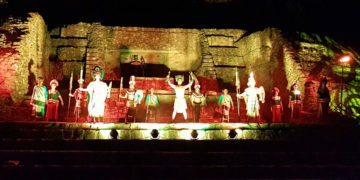 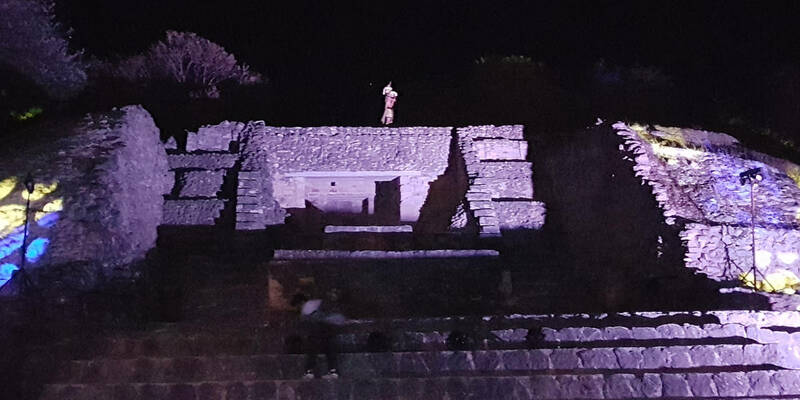 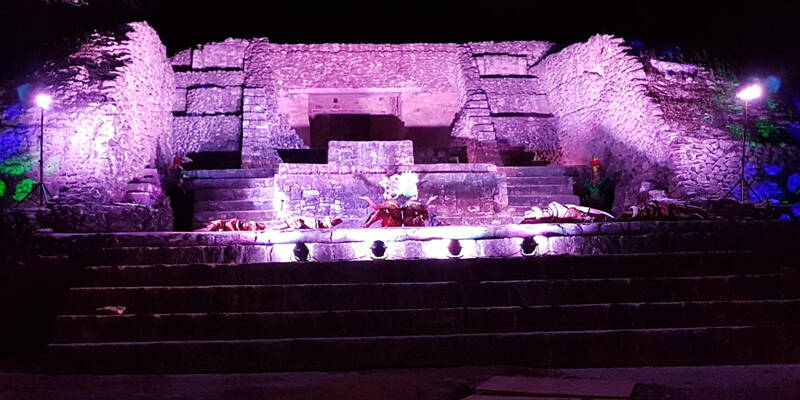 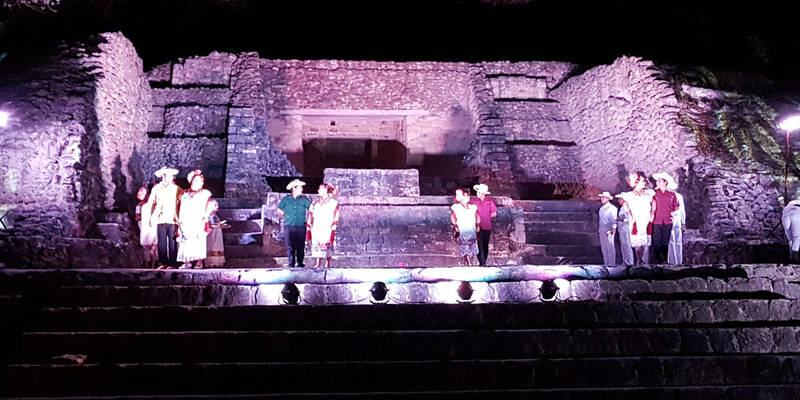 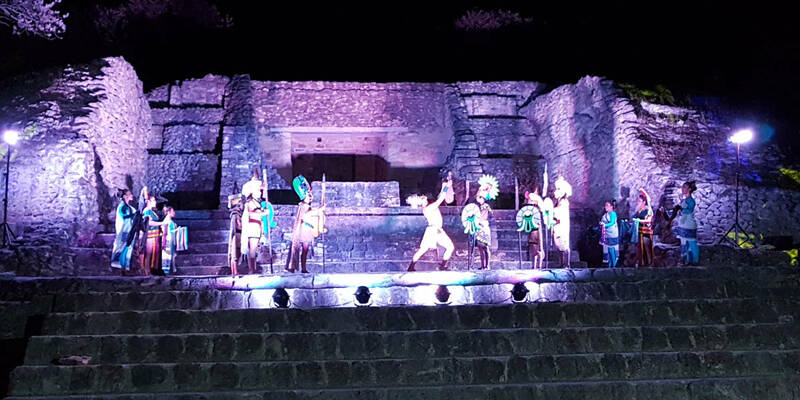 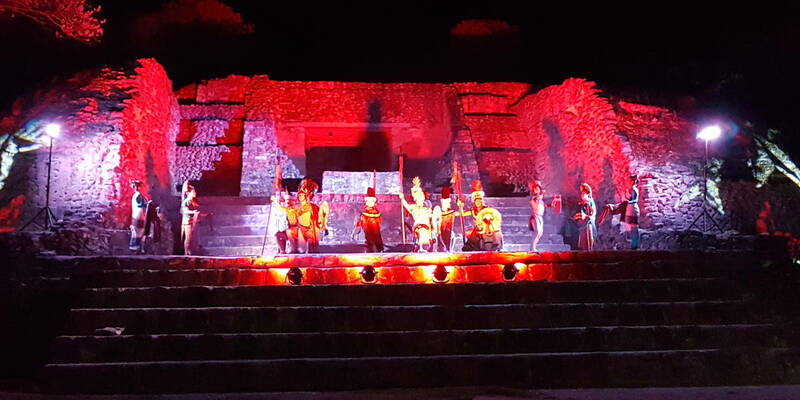 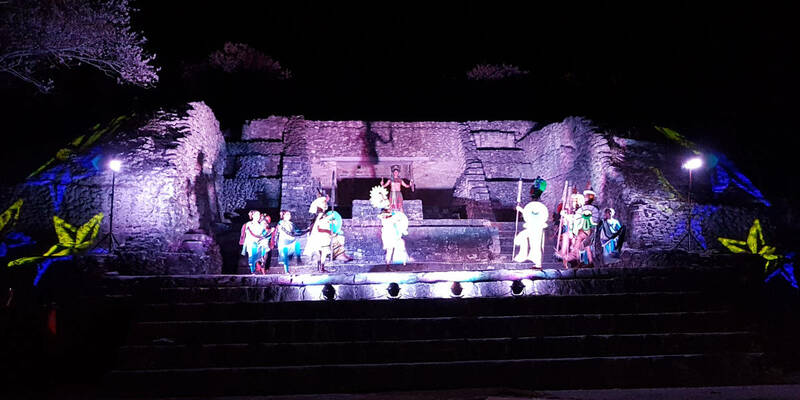 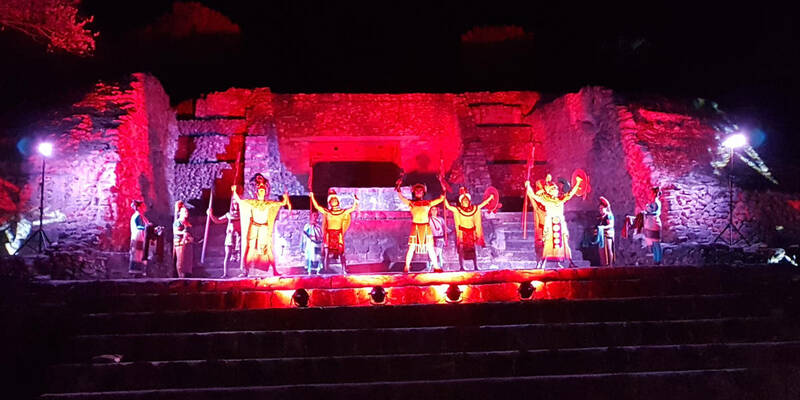 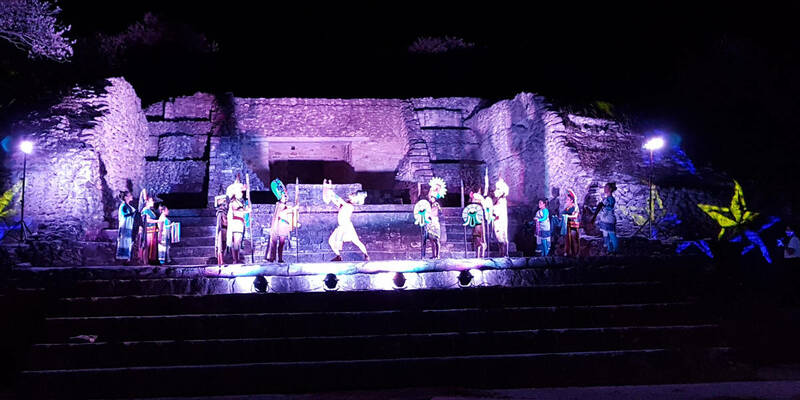 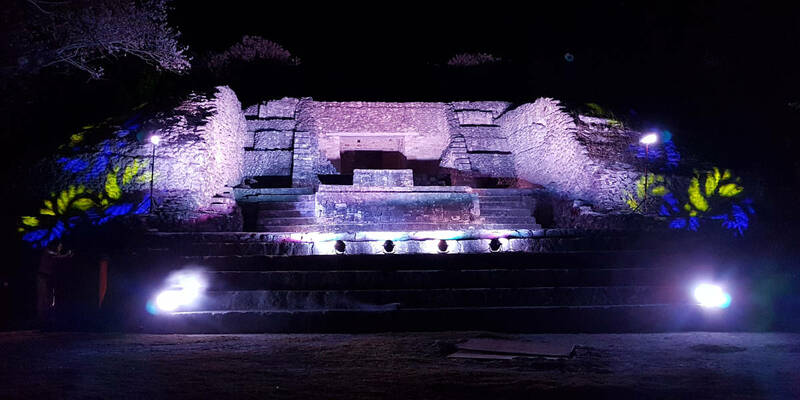 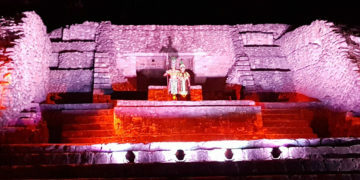 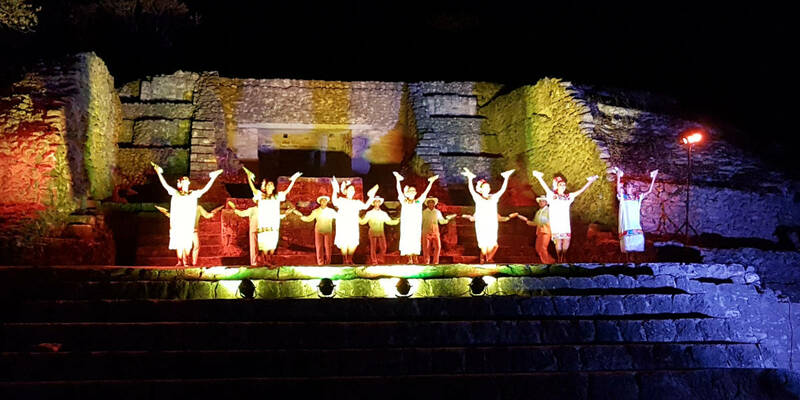 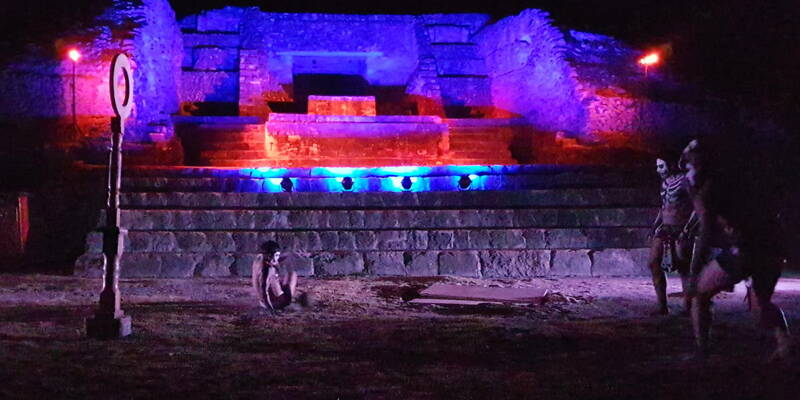 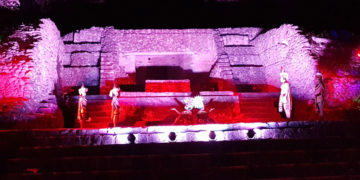 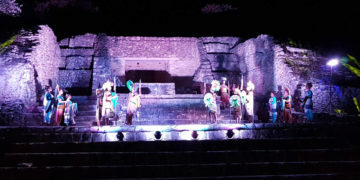 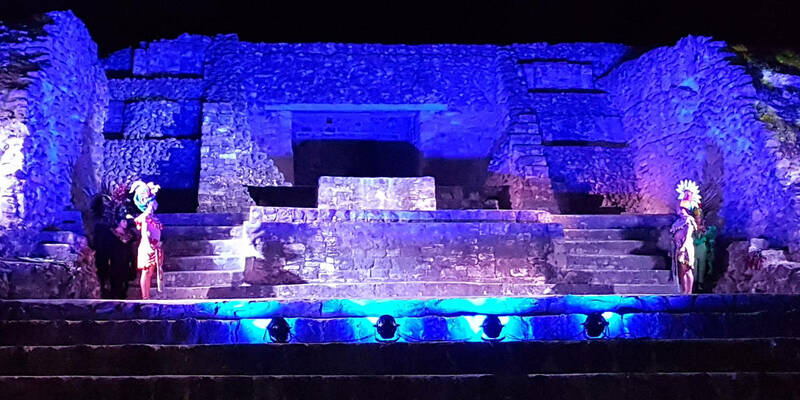 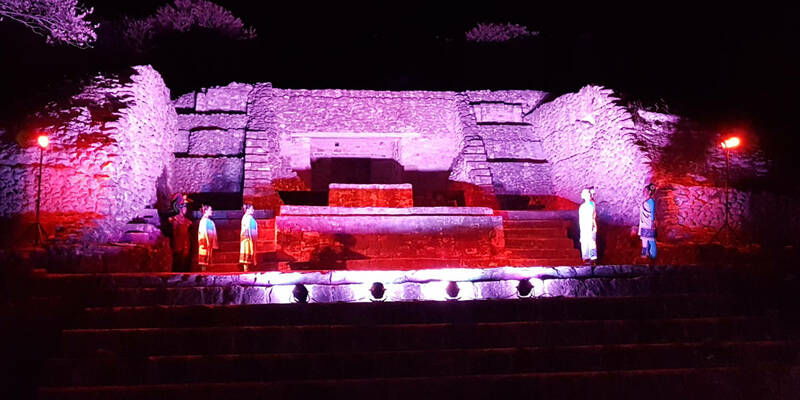 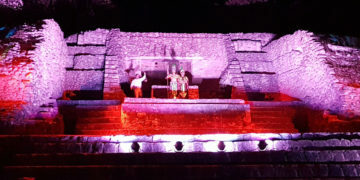 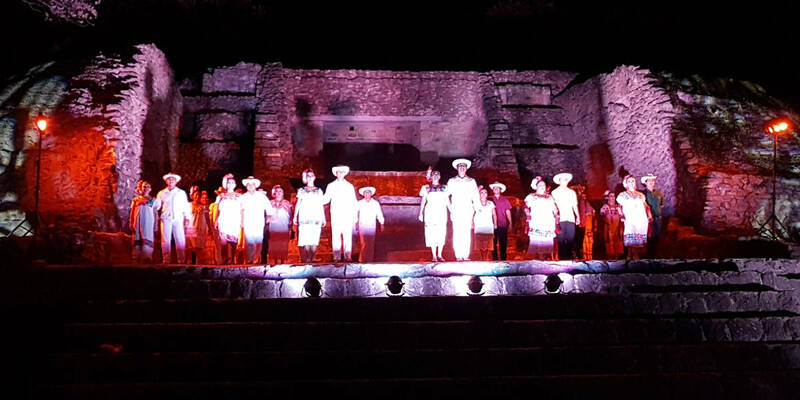 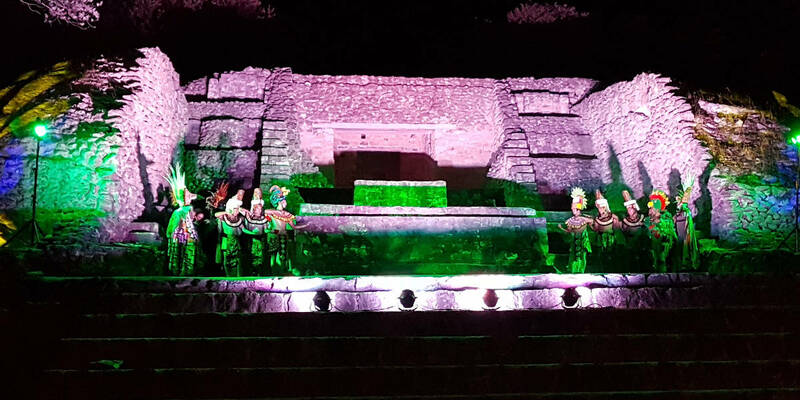 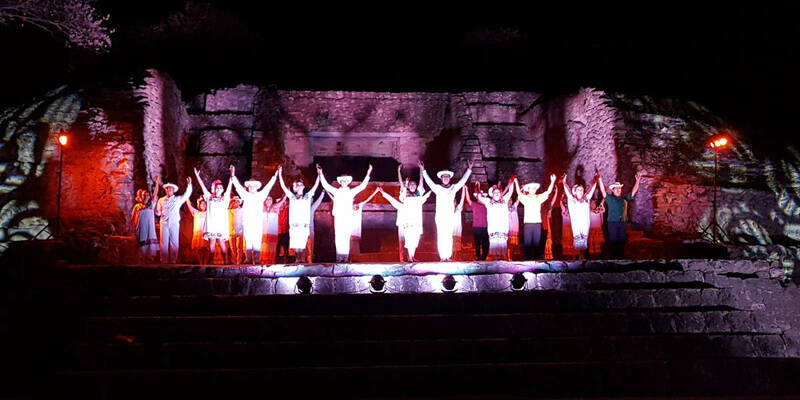 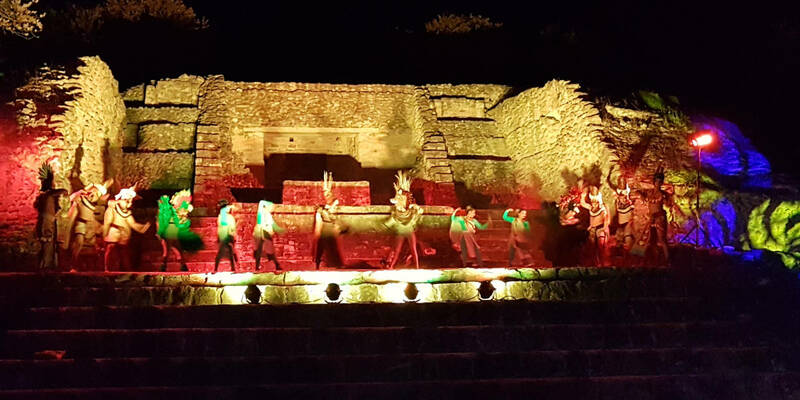 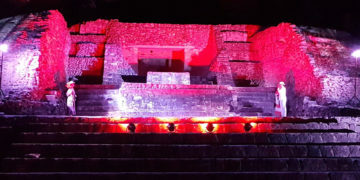 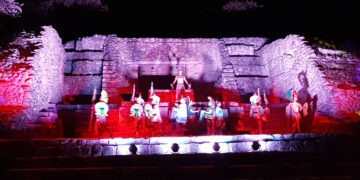 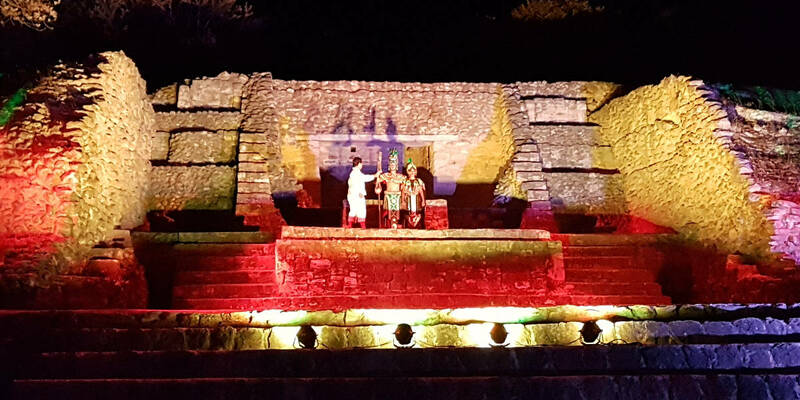 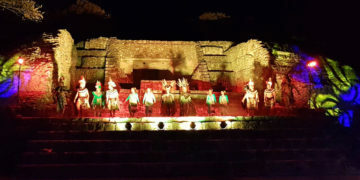 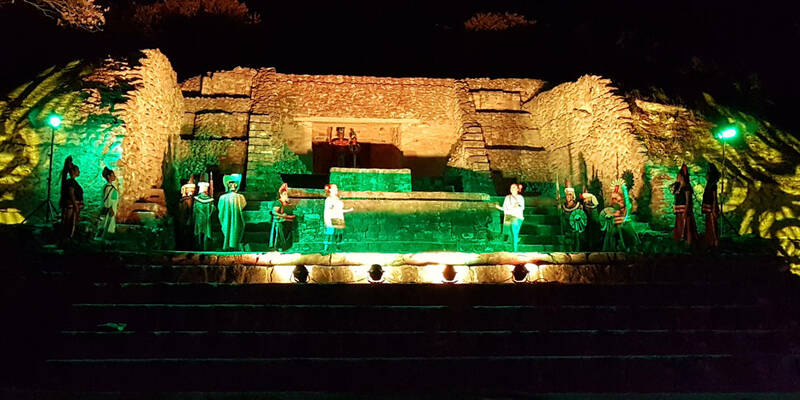 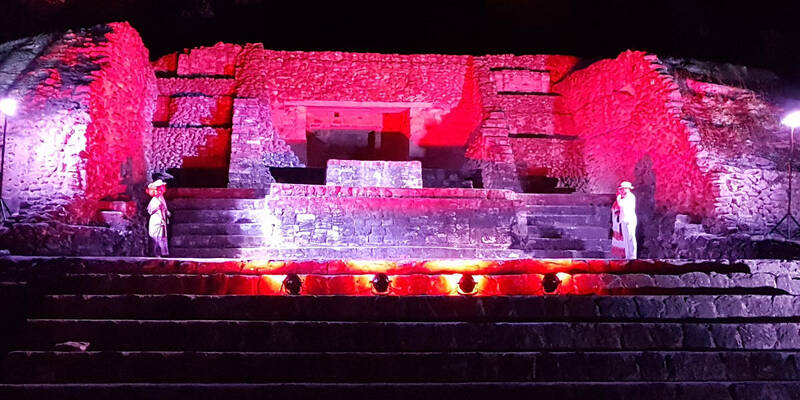 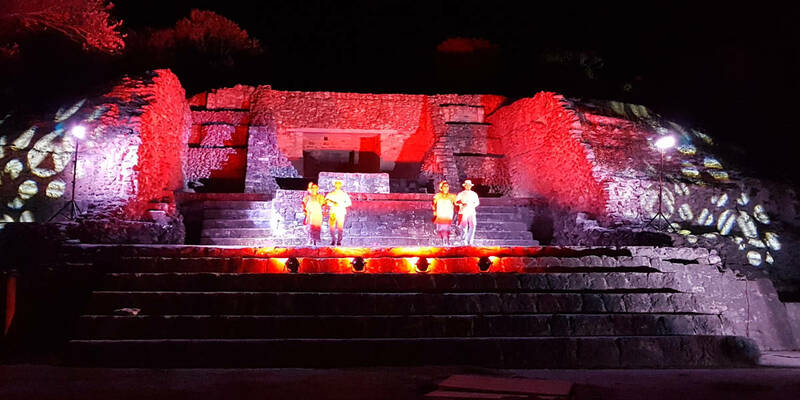 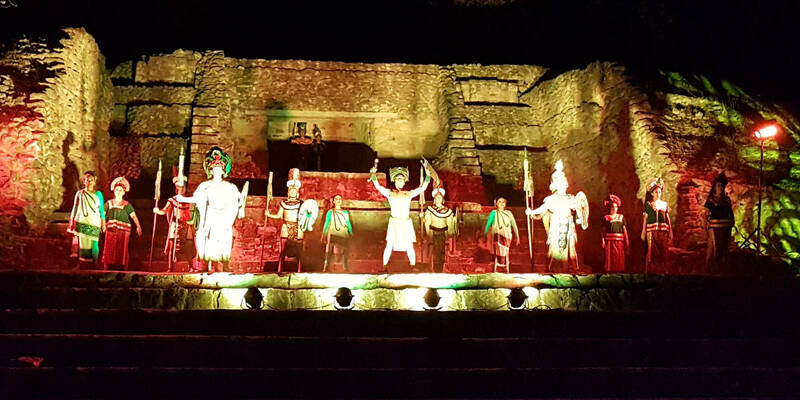 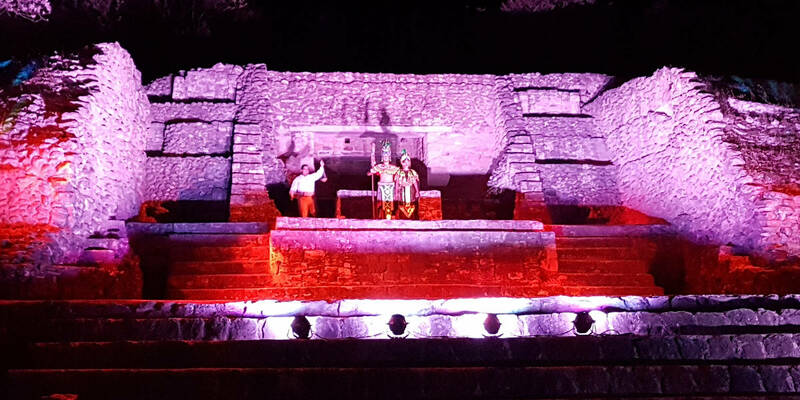 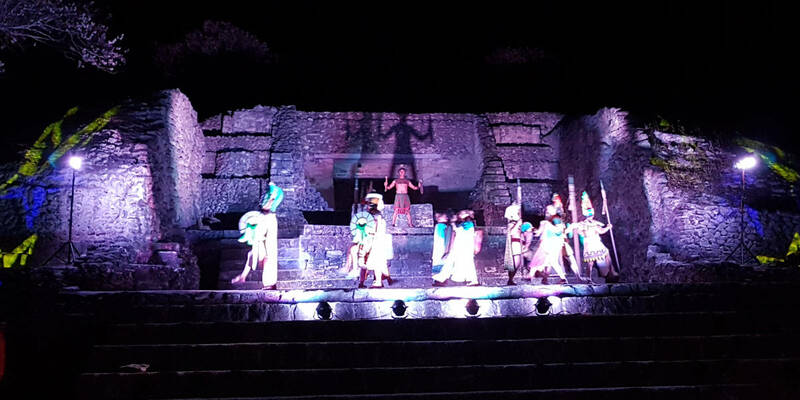 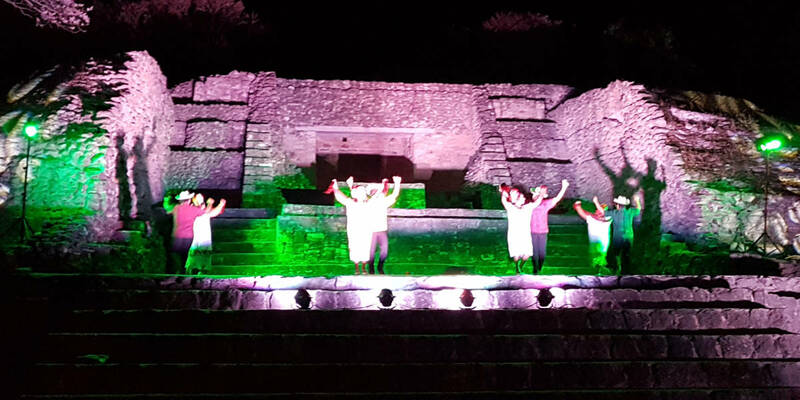 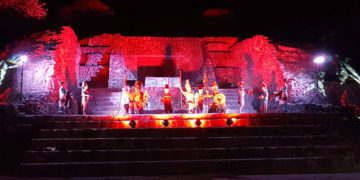 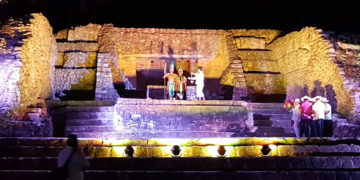 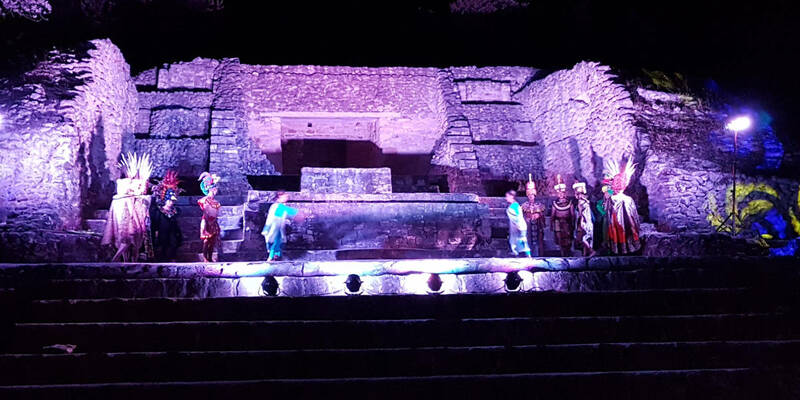 The excellent music, lighting, and sense of presence of millenia of Maya kings, royalty, commoners, and the Temple 7 itself — you just have to be there! 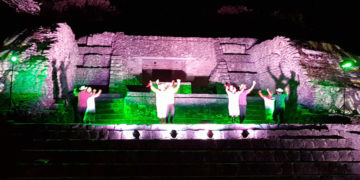 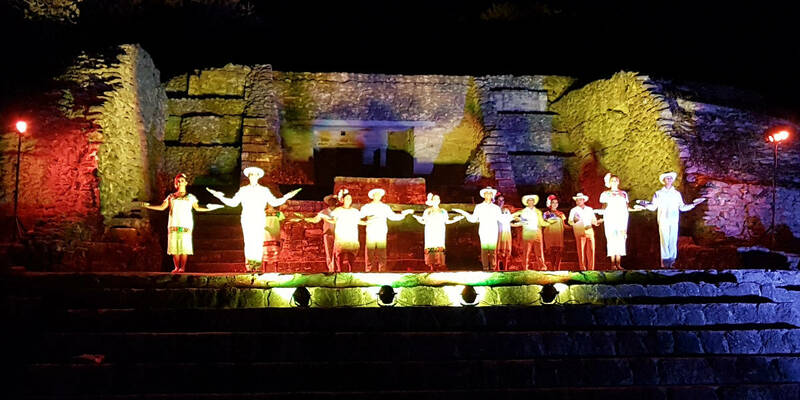 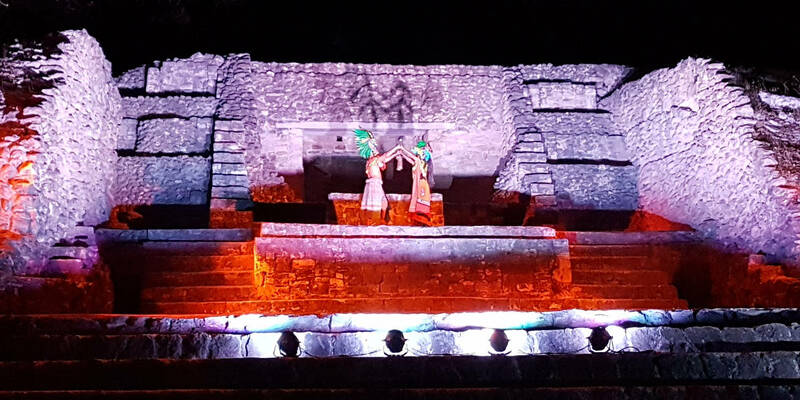 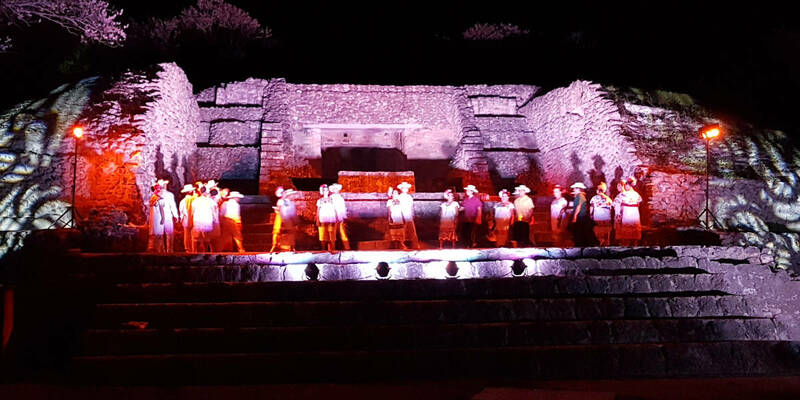 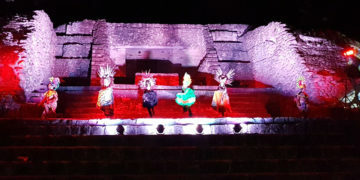 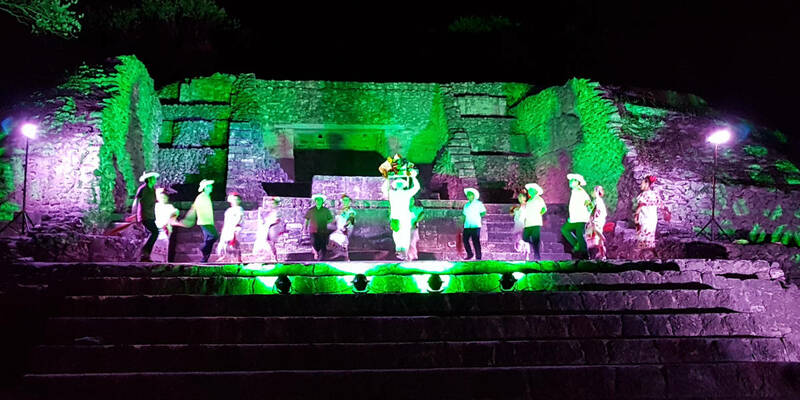 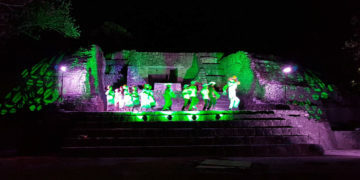 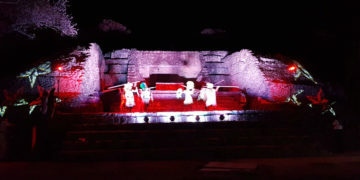 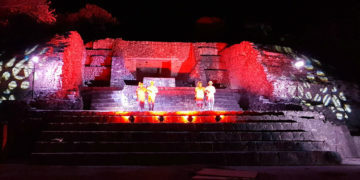 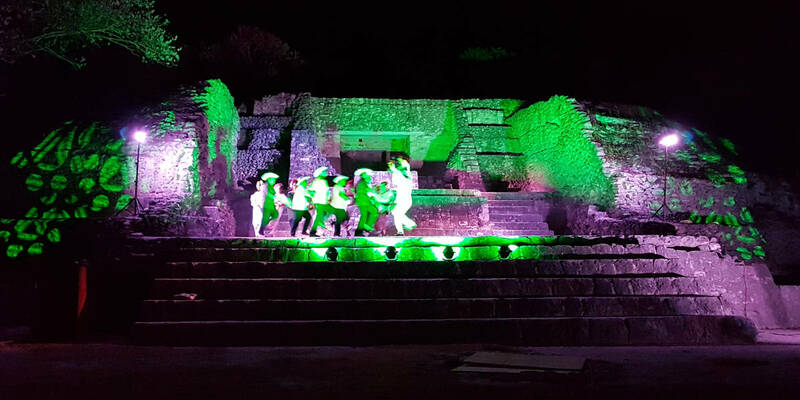 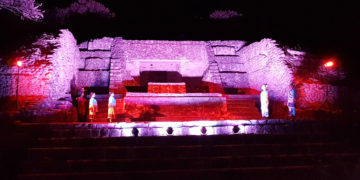 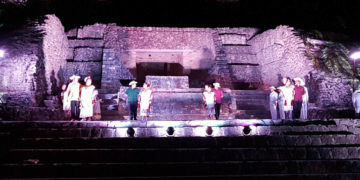 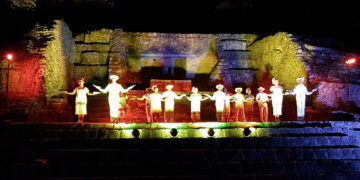 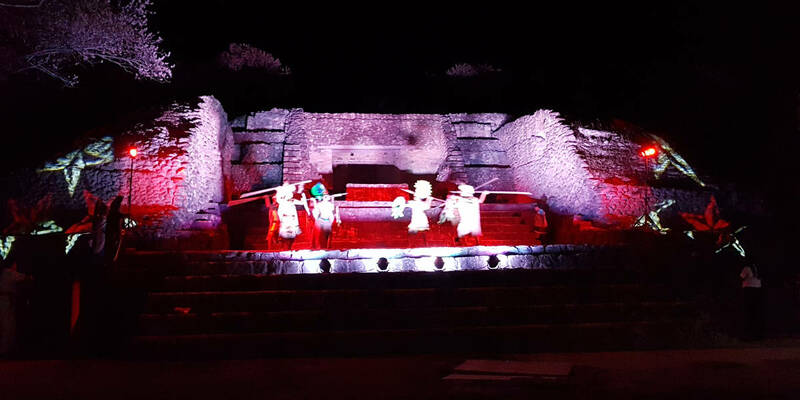 Immediately following the wedding of Zazil Há and Gonzalo Guerrero, came the Maya/Mestizo dances to represent the centuries of Maya/Mestizo culture in this area. 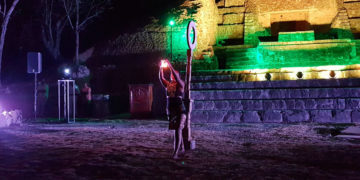 There was a break for Maya refreshments and some other announcements, after which we were treated to a demonstration of the Pok-ta-Pok Maya ball game by the Sak Xikin Team of Yo Creek, which won the World Championships in this unusual sport. Click on the image to the left for a better view of this sport than the still images below. 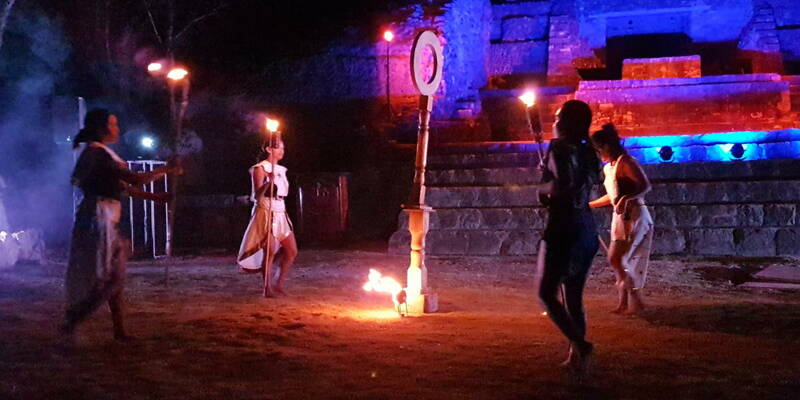 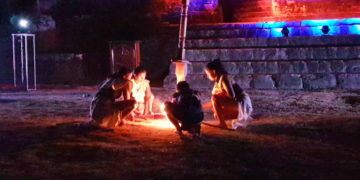 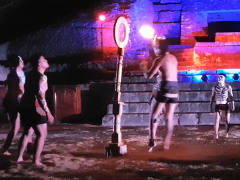 Then they switched to the Fireball Game, where Maya players toss a flaming ball and try to get it through a small hoop. 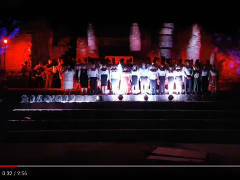 Click on the left for a Youtube video, which gives you a better idea of the game than the photos below. For some really good photos of the events, see this Facebook Album by Dioni Marin. 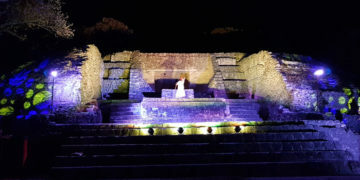 Printed from https://chactemal.com — Maya Wedding 2019, Pok-ta-Pok.